Simply put it’s the RS3 sedan with a hatchback sitting at the rear. At the 2016 Paris Motor Show, Audi thrilled enthusiasts when it announced the RS3 sedan would come to the US. The refreshed Sportback arrived a few months later. Alas, the same promise wasn’t made. Nevertheless, we recently paid a visit to the UK and was offered the chance to sample this bright blue piece of forbidden fruit and apart from the way the trunk works and its more compact silhouette, the Sportback is near identical to the sedan. Based on the A3, it comes packing all of Audi’s cutting-edge tech with a typically stunning interior, but the RS3 adds sharper styling, sporty exterior enhancements and one of the best engines ever made. Seriously. 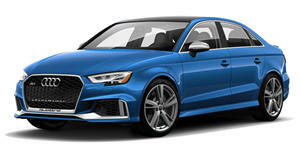 If you think the S3 is hot then the RS3 is scorching, utilizing the same award-winning 2.5-liter turbocharged five-cylinder that motivates the TT RS. It’s been comprehensively overhauled, with an aluminum block and hollow-bored crankshaft helping to cut 26 kg, while increasing output to 395 hp (from 5,850 to 7,000 rpm) and 354 lb-ft of torque that’s developed from 1,700 to 5,850 rpm. A seven-speed S tronic dual-clutch sends power to all four wheels, though now 100% of that can be sent to the rear. In real-world terms that translates to a 0-62 mph sprint of 4.1 seconds – making it quicker than both the BMW M2 and Mercedes-AMG 45 – and a top speed of up to 174 mph (or 155 mph in base trim). The RS3 builds up speed rapidly and before you know it, the hot hatch has you careening down the road with the sumptuous exhaust note rumbling and popping behind you. It’s worth pointing out just how good the exhaust note is. Like the TT RS, gear changes are gleefully met with pops, bangs and cackles with the exhaust wide perennially open in Sport mode and when high-revving in Comfort. The fun factor comes at a price, however. Fuel efficiency in the sedan is rated by the EPA at 23/19/28 mpg combined/city/highway, with the Sportback doubtless aping these figures. Given its performance capabilities, these are actually quite respectable numbers. But if you plan to spend most of your time in the RS3 gunning around country lanes, trips to the gas station may happen more often than you like. Keep the revs down on long journeys, however, and you may even return 30 mpg. There’s plenty that gives the RS3 away as something a little bit naughty. Aside from its boy-racer Ara Blue crystal effect paint job, the fast five-door looks at you with gaping front bumper intakes and single-frame mesh grille that have been accented with an optional Matt Aluminum styling package. Buyers can personalize their RS3 with similar black or body color packages. Optional 19-inch 5-arm-rotor design Audi Sport alloys, diamond cut and finished in matt titanium, look superb, but sit too flush for such a performance-oriented machine. The 2017 refresh saw the RS3 also receive new bumper designs and lighting graphics and a new roof-mounted spoiler, while other RS-specific design elements include the massive dual oval exhaust pipes and beefy side skirts. The RS3 doesn’t look overly aggressive, certainly compared to hot hatch rivals like the Civic Type R, and Audi Sport has done a great job stamping its style on the car, giving it similar aesthetics as the TT RS and RS5. The Audi RS3 is a high-quality product. At £52,525 (featuring some £7k of options), you’d expect it to be. This is no more apparent than in the cabin, which has been beautifully executed in typical style by the German carmaker. Like its sedan sibling, the RS3 Sportback comes standard with RS-embossed sports seats in Black Fine Nappa leather. In the case of my tester, these were nicely finished with Rock Grey contrast diamond stitching (Crescendo Red is the alternative). If I had been lead into the car blindfolded, I could have mistaken the car for the TT RS – the seats, flat-bottomed leather/Alcantara steering wheel, and the high-resolution 12.3-inch Virtual Cockpit are all the same. This is one of the best displays around, replacing conventional dials with a customizable display. The RS3 came with the pop-infotainment screen that is starting to look dated and is way too small compared to modern offerings. At least you can tuck it away, something its rivals like the A45 don’t offer. Leg and headroom is decent both up front and in the rear, the Sportback offering more headroom than the sedan in the back, but only two rear passengers will be comfortable on long drives. Tall drivers like myself have plenty of space behind the wheel and both front seats boast height adjustment. That said, Audi’s bucket seats don’t offer a properly low-slung driving position. Adjustable electric front seats with lumbar support is a worthwhile option for those that plan long trips. While buyers won’t be too fussed about the RS3’s practicality, they’ll be pleased to know the RS3 comes with decent sized front door bins and glovebox, and a pair of cupholders in the center console and rear armrest. The trunk comes in at 335 liters (11.8 cubic feet), enough to carry a couple of suitcases, while the two-way 60:40 split back seats provide the option to carry longer items as well as a rear-seat passenger. With all rear seats lying flat, the RS3 can carry 1,175 liters (41.5 cubic feet) – which is supposedly enough to carry a bicycle, although we didn’t try. Having driven the TT RS in sunny California, I was hoping my hometown of London would provide the necessary wetness to grease up the tarmac and let the super grippy RS3 loosen up a bit. Alas, the sun was shining throughout my jaunt. 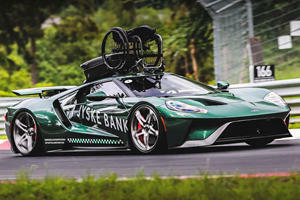 While that made for some nice photography, it meant spirited driving was limited to waiting for a B-road to open up, hitting the gas pedal hard and hoping the local police weren’t waiting around the corner. Within the confines of the speed limit, the RS3 isn’t a particularly exciting proposition save for the engine making itself heard. A responsive rack steers the car exactly where you want, but there isn’t much feel coming through the wheel, numbing the experience somewhat. There’s so much grip you’re never in fear the car isn’t sticking the road like glue, but it would be nice to feel it. 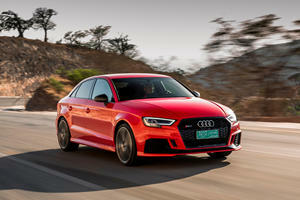 With less weight up front courtesy of a lighter engine block, and the AWD system happy to send power rearwards, the balance of the RS3 is superb, whipping round corners at speed sticking the road as if on train tracks. Gear changes are super quick in both directions, upshifts accompanied by an aural drama that’s lacking on downshifts. The Magnetic Ride suspension does a good job soaking up B-road bumps in Comfort, helping to make the RS3 a car you can live with on a daily basis. You’re not going to have fun all the time in this car, but if you’re someone that appreciates having serious performance at their disposal the RS3 delivers. UK and US options packages are bundled differently. The RS Sport suspension with Magnetic Ride comes standard in the US but you’ll have to tick the $1,450 Dynamic package to get the Sport exhaust, 19-inch wheels, red brake calipers and summer performance tires. Buyers that want to go all out can opt for the $4,800 Dynamic plus package (which necessitates optioning the Dynamic Package a well) that adds a 174-mph top speed limiter, front ceramic brakes (with gray and black calipers), and a fixed sports suspension. The Technology package at $3,200 is also tempting, adding MMI Navigation, Audi’s sublime virtual cockpit and a superb Bang & Olufsen sound system. Throw in the $1,000 RS design package that forces you to add $600 carbon-fiber inlays, and the $1,000 paint job and you’re looking at price tag of $64,800. That’s almost exactly what you’ll spend on the TT RS, which if you’re single or without children is by far the better option here. However, if you live outside the US and like that hot-hatch look, or are US based and want the convenience of back seats and a half-decent trunk, the RS3 Sportback and Sedan are the way to go.